Boxship Samskip Endeavour was bunkered with hydrotreated vegetable oil made from used cooking oil. The GoodShipping Program - an initiative that aims to drive the use of biofuels in order to make the shipping industry more sustainable - has announced that it has helped organize the first fossil-free ocean freight shipment for its customers. In a collaboration between GoodFuels Marine and Samskip, the Samskip Endeavour - a container vessel that carries over 800 containers and normally runs on a combination of heavy fuel oil (HFO) and marine gas oil (MGO) - was bunkered with 22,000 litres of hydrotreated vegetable oil made from used cooking oil. 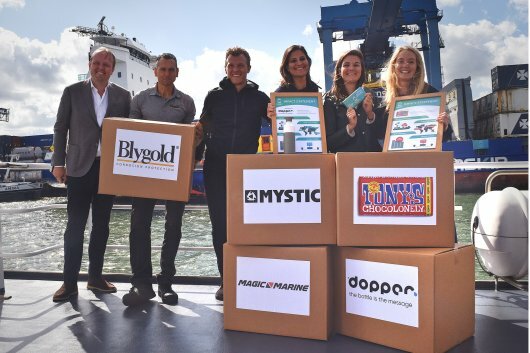 It enabled cargo owners Dopper, Blygold, Magic Marine, Mystic and Tony's Chocolonely to collectively avoid the emission of 40 tonnes of carbon dioxide (CO2). "With this first bunkering, GoodShipping shows that it is possible for cargo owners to influence the carbon footprint of the sea freight in their supply chain," the Amsterdam-based initiative said. Calling on other firms to follow in the footsteps of the aforementioned cargo owners, GoodShipping said: "We don't have to wait for the sulphur cap, the next IMO meeting or for someone else to go first. You can make a positive impact, today. "Any company can join our program and have their sea freight shipped climate-neutral," it added.